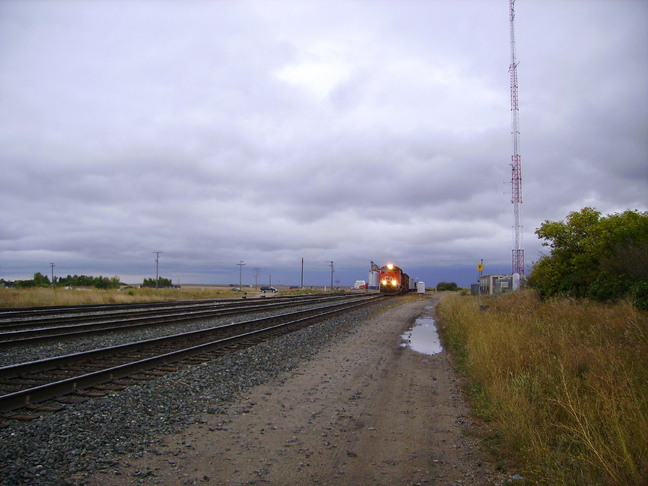 The clouds are still heavy and the ground is still soaking wet but this train guy soldiers on ever ready for that one great shot. No need here to find the sun at my back – or better still – at that excellent angle that shows off the details I’m looking for. Quite the contrary. So I’m tempted to show off all the lines and angles of the prairie I love to model; all right and parallel and vanishing into a point somewhere on an endless horizon. This is a tough one. Even during my years in N scale I struggled with the issue of ‘space’. Not just the room I’d allotted myself in a bedroom or a basement because I had all I wanted, but rather the real sense of the wide-open space necessary to successfully recreate a Canadian prairie scene. Take note of the ‘backdrop’ here. The sky falls down and meets the scenery as if it were cut from some great sheet of drywall and hammered onto the plywood landscape with no thought given to distance or perspective. That sharp edge all too vividly defines the end of the world. Well what to do? Loose your tiny self in the scene. Lift the prairie up to as close to eye level as you can and let the few near structures rise above you like that radio antenna. Choose a special place where that track wanders away from the viewer and offers real perspective. Force the road into the distance by narrowing it dramatically and line the horizon with very small bushes and smaller scale power poles. It can work for you.